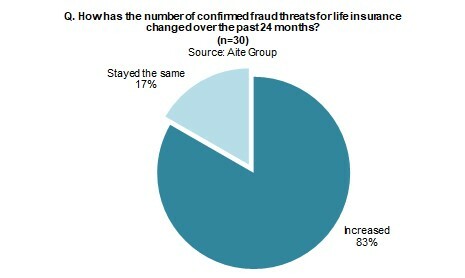 More than 80% of life and annuity carriers report that fraud has increased over the last two years. Boston, February 7, 2019 – Life and annuity carriers struggle to mitigate fraud, with the primary issue being detection. Analytics tools, including the use of artificial intelligence and machine learning, have advanced the detection of fraud, but life and annuity carriers have been committed to developing internal tools that limit their ability to mitigate fraud to a large scale. Are they doing themselves an injustice? This report details some of the key trends driving fraud, the types of fraud life and annuity carriers are detecting today, carriers’ biggest fraud concerns, and their strategies and tools to mitigate fraud. It is based on 35 online and face-to-face interviews Aite Group conducted from April 2018 to October 2018 with executives at U.S. life insurance carriers as well as at technology vendors and state regulating agencies within the United States. This 23-page Impact Note contains 15 figures and one table. Clients of Aite Group’s Life Insurance service can download this report, the corresponding charts, and the Executive Impact Deck. This report mentions Accurint, Cyber Fusion, Early Warning, Giact, LexisNexis Risk Solutions, Mimecast, Pindrop, Securonix, Splunk, and The Coalition Against Insurance Fraud.